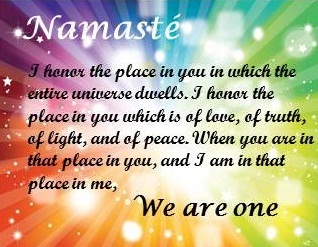 Whether you have a felt sense of our interconnectedness through an STE or through study and meditation, once you have the awareness that we are all one, the next step is to live from that knowing. As you go about daily life, keeping that awareness foremost in your mind transforms how you live. Participation in community activity is another way in which people might first feel a sense of interconnectedness and experience the effects of universal love. Universal love becomes a way of life. /> Relationships are the training field in living from universal love. Love in action involves not only our personal relationships, but also our communities. Love In Action (LIA) programs of Eternea include all types of projects being designed and carried out by communities of people who are bringing more love locally. LIA’s web page and message board will be places to discover others like yourself in your community who want to support each other as they develop local projects that enhance an awareness of Oneness. what are we going to do with that feeling? LIA now hosts a forum for discussion about existing programs and programs we can create together that demonstrate "love in action." This forum is intended to be practical and helpful. Please feel free to share a couple of examples of projects that are bringing people together in creative ways. You can visit the forum by clicking here. If you want to tell everyone about programs in your local community that exemplify love in action, please tell us via the link below and we will add more to this page. Kathy, an oncology Physician Assistant, wrote about Joan's Monarch Wishes, an initiative organized by a woman who lost her mother to cancer. The organization collects the names of cancer patients who would like to receive cards and then volunteers send cards out to people they choose from the list. Volunteers and names of people with cancer come from all over the country. After retiring from careers as a senior manager and an organizational development professional, Mary Ellen and her husband are using their professional skills to help the homeless in Savannah, GA by teaching workshops that assist in removing the blocks that keep us from self-acceptance. They provide their own materials and build their workshops from scratch at no cost to anyone. After going to the Eternea website and reading about Love in Action, Margaret initiated a virtual group on her blog site. People who want to join are committing to conduct a Random Act of Kindness at a regular interval, and come back and share their experiences. James has developed trainings in service and leadership for youth from 4th grade through high school. The focus is on “Small Acts of Kindness” and service to the school and community, thereby teaching love in its most direct way—through experience. Tina wrote in about “Pets of the Homeless,” a nonprofit volunteer organization that provides pet food and veterinary care to the pets of the homeless and less fortunate in local communities across the United States and Canada. Volunteers are the backbone of this incredible outreach and their efforts have touched the lives of countless animals. Grants are used to fund veterinarians that go to where the homeless congregate and provide veterinary care such as vaccines, spay/neuter and other needed treatments. Grants are also awarded to homeless shelters looking for ways that allow pets sanctuary with their owners. Finally, grants are awarded to individuals on a case-by-case basis, depending on urgency, long-term health success and financial support. The Common Reading Experience began in Durango seven years ago as a project to involve and invite the entire community to read a single book each year. Now, reading their seventh book together, community members along with students and faculty from Fort Lewis College gather in a variety of venues around the community to discuss subjects in each book and bring the books to life. When reading Folding Paper Cranes by Fort Lewis College professor Leonard Bird about his experiences in the aftermath of Hiroshima, students in the Durango public school system folded paper cranes for peace, just like Japanese students have done. When reading The Beast in the Garden about mountain lion encounters with people, as houses encroached on their natural habitat, the FLC Art Gallery created a display about mountain lions' habitat and featured artists' renditions of mountain lions. Similar programs exist in many cities throughout the country. The books are decided by recommendations from the community and from voting by interested parties, so of course they vary from place to place. The Common Reading Experience brings people together from all walks of life to learn from each other, to share ideas, and to connect. The hOurWorld project is located in over 65 cities in the U.S. and has over 4,000 members. The purpose of the Pagosa Time Bank is to give neighbors the opportunity to share skill sets with each other on an hour-by-hour basis. One hour of work exchanges for one hour of work, no matter what the work being done. The system honors that each of us have skills in some areas, but not in others, and that sharing what we know how to do is a way of honoring the worth and dignity of each of us. It's also a great way to meet community members outside our usual circle of friends who, let's face it, tend to be a lot like us. As we come to value their skills, we might also come to value their opinions even when they differ from ours, and from that valuing, love is grown. Individuals can use their own talents to create a community project that increases connection and love in the community and may also relate to communities far away. We’re all familiar with initiatives to collect supplies and money for communities hard hit by natural or man-made disasters. In fact, most Eternea supporters have probably been involved in such initiatives. Those projects are absolutely wonderful and benefit not only those people helped by the donations, but also the people offering the donations whose lives are enhanced by the process. Another example of using one’s unique talents to create unique community projects is by fabric quilt artist Allison Goss. In 2002, Allison envisioned Creating a Rainbow People project in Durango, CO. When the United States invaded Afghanistan after the tragedy of 911, Allison felt great compassion for the women and children of Afghanistan who were being greatly harmed as a result of the invasion. 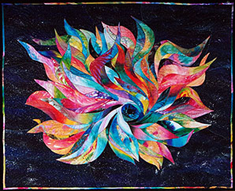 She conceived of the idea of the quilt, made from fabric painted by members of the community and then woven together in a spiral design with an eye in the middle and a starry sky background. She invited several segments of the community and 38 people helped paint swatches of fabric. She then quilted the beautiful piece of art shown above. Allison put the quilt up for silent auction, and the money raised was sent to the women of Afghanistan. In this way, the Durango community was able to weave a connection with women in Afghanistan, sharing love and support abroad while empowering the Durango community to connect with one another. Looking at the quilt, one sees the weaving together of each person’s individual potential to create a whole, supported by God (the eye) and nature (the starry sky.) Creating a Rainbow People demonstrates how love and individual contributions can create a magnificent whole that is greater than any one of us could do on our own. To see more of Allison’s creations, go to www.allisongoss.com. Love in Action can have impact within a small community of people by increasing people’s experience of similarity and connection. One example of this is a Dream Helper Ceremony. Everyone in the group then dreams on behalf of the chosen person, without knowing the specific issue that person is working on. Each member of the group remembers their dream from that night, writes it down, and then shares their dream at the next gathering of the group. After all of the dreams have been told, the focus person shares the nature of their issue and how the dreams have had an impact on their resolution. As a final step, each member of the group then shares how the dream related to their own lives as well. In studies using this method, people have been surprised at the common themes that run through the dreams, about how helpful they are to the focus person, and how important the dreams are to their own growth. It is one more way to recognize how connected we all are. The Missouri prison system has developed individualized treatment plans for juvenile offenders that result in their ability to express emotions, resolve conflicts, understand the effects of their behavior on others and transition to responsible citizenship prior to their release. It is less expensive than conventional treatment (New York spends four times as much per day on their youth) and has a recidivism rate of 8%. (New York’s rate is 89 %.) Missouri has been so successful that California, New Mexico, and Louisiana are following suit. These youth have been treated with compassion and, as a result, have gone on to lead more compassionate lives. These and other projects urge us to "think out of the box" about how our measure of love can be put into action. Joining our efforts with others in community together, we can know others more deeply and as equals in our yearning for meaning and love in our lives. what are you going to do with that feeling?